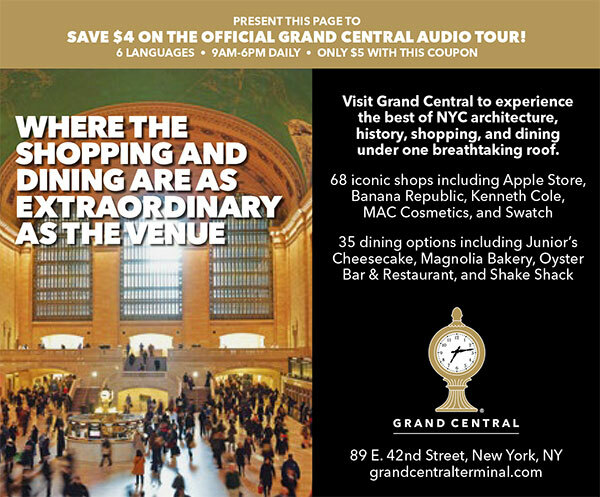 Grand Central Terminal is known for its architectural highlights, but this tour will give you back story on the station’s little-known anecdotes, archival material and secrets (tennis, anyone?). Listeners can take the “local” or “express”—if visitors are interested in more in-depth information, there are options for additional material at the push of a button. The self-guided tour can last as little as 30 minutes to just over an hour. Visit the Tours window in the Main Concourse, open 9am-6pm daily. The tour is available in English, French, Spanish, Japanese, Italian and German. Orpheo’s state-of-the-art audio device and headset comes with a map of the terminal for just $9 per adult and $7 discounted (seniors, military, students, kids). Thought Gallery readers can enjoy the tour for just $5 by presenting the image on this page at the Tours window.